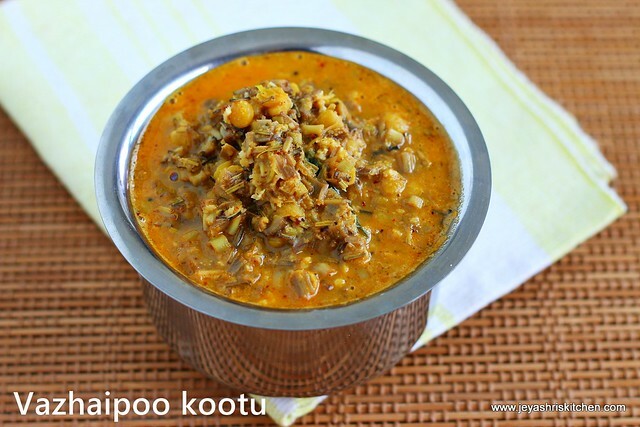 Vazhaipoo kootu | banana flower kootu is a traditional south Indian gravy made with vazhaipoo. We generally make it for sumangali prarthanai. Especially mom's side they make this very often. When i was small i never eat this and amma force me to take atleast one spoon. 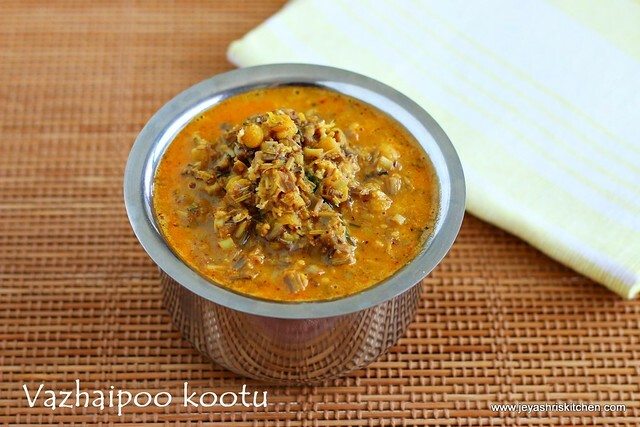 But later after marriage developed lot of interest towards traditional food items and started liking this kootu. Oncewhen i went to my mom's house during a vacation, i asked amma to make this kootu for me. Amma was super surprised and happily made for me. We call it as vazhaipoo thani kootu. Check my vazhaipoo vadai and vazhaipoo paruppu usili. Cut the vazhaipoo and soak it in water. If you are cutting the one day before, add few drops of butter milk to the water and keep it outside. Even if you want you can keep it inside the refrigerator. Soak the channa dal for 30 minutes. In a pan add the vazhaipoo (drain water before adding) and add turmeric powder, salt and asafoetida. Add the thin tamarind extract to this. Cook the soaked channa dal and toor dal in a pressure cooker. Keep both in different vessels while cooking. Roast the ingredients given under the head, "to roast and grind". Grind this into a fine paste and keep it aside. Add the cooked channa dal to the pan and add the ground paste too. Mix well and add the cooked toor dal to this. Dry roast the coconut (3 tblsp) in a pan till it becomes golden brown and add to the kootu. Mix well and if needed add 1/2 cup of water. Add jaggery to this and mix well. Temper with mustard seeds and curry leaves in coconut oil or normal cooking oil. Switch off the flame. Kootu is ready to serve. Generally we add kuzhambu karuvadams to this kootu in the last. You can saute it in oil and add. Since i do not have i didn't add. Adding vellam balances the spiciness of the kootu. So do not skip that. Tempering with coconut is recommended for this kootu. If you do not like the smell, add normal cooking oil. Looks different must try recipe. I am a huge fan of your blog and your simple, detailed explanations of recipes. Ive been recently thinking about making thani kootu - but i heard that they make with with various kaai from other dishes for sumangali prarthanai. This looks amazing and a must try recipe!